Home > Solar Policy > Where are the visionary leaders that can make Australia (and the world) 90% renewable? Where are the visionary leaders that can make Australia (and the world) 90% renewable? 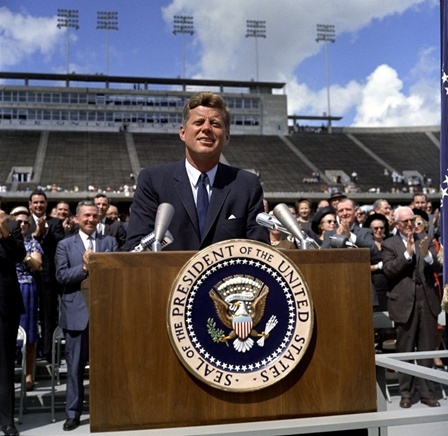 On May 25, 1961, President John F. Kennedy announced the dramatic and ambitious goal of sending an American to the moon and back before the end of the decade. No one had any idea if it was even possible. The technology needed had yet to be invented. Now that’s what I call visionary leadership. Next month will be the 50th anniversary of JFK’s assassination. What a stark contrast JFK is to the current crop of pollies in Australia (and most of the world for that matter). If we are to have any hope of avoiding catastrophic climate change in our children’s lifetimes we desperately need a politician or two with JFK’s vision to take charge. We choose to go 90% renewable by 2020. We choose to transition to clean, renewable energy in this decade, not because it will be easy, but because it will be hard, because that goal will serve to organize and measure the best of our energies and skills, because that challenge is one that we are willing to accept, one we are unwilling to postpone, and one which we intend to win! Tragically, the thought of an Aussie pollie making such an amazing speech in 2013 is quite literally laughable. You and I both know it ain’t gonna happen. Our current PM is too busy scrapping the Carbon Tax (although it is working), scrapping the science portfolio and getting some unemployed youth to plant a few trees. What a visionary! Our kids will be reading about those great achievements in the history books for centuries to come! If Tony had the balls to really try and lead the world to averting a climate disaster, then he may be surprised to know that a few very credible and pragmatic engineers have knocked their heads together and worked out a plan, using existing technology, that would make this lucky country of ours 90% renewable. Some of the brightest minds in the Australian engineering community believe it is perfectly feasible. And these aren’t your greenie hippies who have concocted an airy-fairy plan after smoking too much weed, these are established and eminent scientists and engineers. My favourite example of a plan for an almost totally renewable Australia comes from the University of Melbourne’s Melbourne Energy Institute. Dr Peter Seligman put it together in 2010, and it would provide 90% of Australia’s energy needs with renewables, with current technology at a reasonable cost. 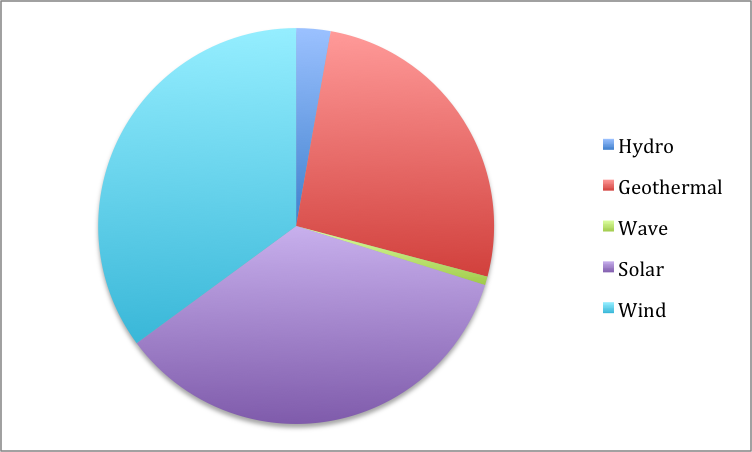 The mix of generation needed to get to 90% renewables. To put the amount of solar needed into perspective, it is the equivalent of a solar farm 70km x 70km using today’s technology. The number of wind turbines that you would need to build would fit in a 100km square. Yes – that is a fact – the generation of most large-scale renewables is intermittent. But all that means is that we need energy storage. A lot of energy storage. And no – I’m not talking batteries. Peter’s solution is a huge “pond” on top of a cliff in the Nullabor (which is of course National Park – but we can worry about that later!). He envisages a 7km diameter by 20m deep pond that stores seawater 90 above sea level. When electricity is needed the water is released back to sea. When there is excess energy, the water is pumped back up the cliff. Simple technology. We already have established renewable energy companies like Snowy Hydro that could design, build and operate such a scheme. In fact it should be easier to build than the monumental Snowy Hydro scheme. The whole scheme, i.e. the solar, wind, geothermal, wave and pumped storage, and high voltage interconnects costs about $250 billion. Which is a lot of money. But as Peter points out, you could fund it for $1.40 per person a day. Peter compares this with the average daily expenditure per person on gambling in NSW, which is $3.70. But unfortunately, our politicians aren’t engineers and the current crop seem to actively distrust science. The new government have bought into the anti renewables propaganda peddled by their paymasters, and haven’t got the will or discipline to actually look at the numbers or the physics of renewable energy. So we are stuck with a policy driven by the sale of renewable energy certificates that aims to only get us up to a lowly 20% penetration of renewable energy by 2020. Let’s be honest 20% renewables is piss poor for a 21st century energy supply system. The best way to decarbonize the world’s energy systems is for a plucky little economy like Australia to actually do it. Let’s show the world that it really is possible. Hey – perhaps it isn’t! But we’ll never know unless we give it a go. Yes – it’s risky – all big projects are, but, honestly what is the worst that can happen. Worst-case scenario is that we all lose the grand total of less than $2 per day (before tax!) for the next 10 years. Boo hoo! I don’t care if you don’t even accept the facts on global warming. A renewable based economy that requires almost no fossil fuels is good news for everyone (except perhaps a handful of billionaires). The fact that Australia, the US and the rest of the World just sit on our collective arse and declare it all too difficult, too expensive and too risky is a crying shame. JFK must be turning in his grave. 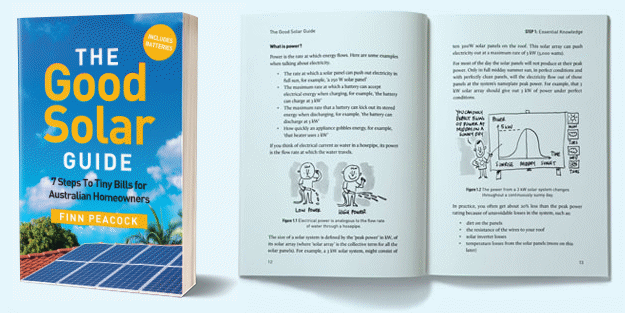 Next Article: The Truth About Your Roof And Solar Power: 3 Questions You Must Ask. Unfortunately the Australian sheeple persist in electing f***wit politicians like the red-headed witch, the KRudd & the Wacky Wabbott instead of people with at least half a clue like Big Clive. Note also that JFK didn’t remain on the yankee scene very long despite being a far better option than any US president since. I’m sorry but Big Clive as you call him is out for one person and that’s himself. As for Gillard and Rudd they are old news but at least Abbott has cut through the crap and will dismantle the Carbon Tax which was not doing a thing to help the environment but raising capital for those before to waste on failed policy after failed policy. The amount of money wasted on Green projects would have been better spent of educating our children or providing beds in hospitals for all the good it has done. The only constant in nearly every Green project is the rate that they fall over taking millions if not billions of dollars with them. Renewable energy or billions wasted and its not a trick question? You obviously have no idea of the legal of subsidies and tax concessions given to the carbon energy sector, coal, gas and oil. The pricing of carbon has already driven a reduction in carbon energy use a different helped a host of businesses reduce emissions energy usage through updating equipment and putting in their own supplementary energy production. The research grants are producing positive results in equipment and technologies. Of cause a lot of it fails or proves non viable. That is the nature of research, but If it wasn’t done you would still be hiding from lions on the SE African savannah. Yes I am familiar with the subsidise but i am also familiar with the billions watsed on so called renewables that didnt have a snowballs chance in hell of ever doing what was expected. By the way i would rather hide from the lions then stand there and be eaten as is your want. What a load of rubbish. if we moved everybody out of the Northern Territory and made the place 100% solar panels, moved everybody out of South Australia and made that 100% batteries there would be enough power generated and stored to run Sydney for 18 hours a day. There are no “renewable” power solutions now or in the pipeline that can make any country 90% reliant on that kind of power except in somebodies demented dreams. This is the kind of airy fairy cods wallop that makes people who are against “renewables” shake their heads and point out the loonies. The set up costs would be minimal if those figures are to be believed which I doubt after spending an inordinate amount on our own 100% solar power plant for our home and then add the costs of maintenance of the panels, batteries, wind turbines and the cost per consumer would be astronomical. Of course the author is banking on people taking the IPCC and Climate Change Commission statements of a Climate Disaster as fact when it has been shown time and time again that that is so far from the truth as to be a work of fiction. The dire warnings over the last 10 years that have lead to Governments spending billions on useless infrastructure have shown that possibly 1% of what these august Commissions say can be taken as fact. The other thing of course is the vested interest of the Author as CEO of a Solar Company that really has to add that note of self interest to the whole article and makes one wonder as to the real reason behind it, true belief in the cause or advertisement of his Company. We can’t rely on the present crop of lamebrained elected officials to do anything but line their own worthless pockets and those of their big-business cronies. Whether or not privatization can ever be made cost-effective, it will still be pushed by both major political parties if only because a privatized entity doesn’t represent a potential responsibility. A number of comments have suggested a large scale renewable energy operation has to be more efficient than a zillion itty-bitty ones, however that logic fails to acknowledge the unbridled avarice of public companies & the fatcat executives. I suggest that until / unless the prevailing culture of greed is rendered totally unacceptable, the ***ONLY*** viable renewable energy solutions are those controlled 100% by individuals. As the Man said a while back, the LOVE of money is the root of all evil. Personally I don’t give a rats what politicians or multinationals do …. I’m relatively close to being self-sufficient & getting closer daily. I don’t pay for electricity / water / cleaning services, most food is home-grown, and I’m working through the battery-electric car options. As long as ‘the system’ continues devising ways to fleece the sheeple, I’ll continue to develop ways to avoid being part of the system. Buy a horse and that benefits the garden at least – yep, I know it farts though! I dont have to buy a horse as we regualrly have 5 miniture horses and two full size horses come over to feed on our grass and leave there payments for the garden, great strawberries this year and the biggest mushrooms i have seen in years. Unfortunately weed seeds survive and thrive in horsesh*t… . Cowpats, sheep manure and even well-aged chicken droppings are better options for home orchards and vege gardens. Mine dew, Larnach Castle in Dunedin was powered with methane from its horse stables well over a century ago. No doubt malicious critics scoffed at such a technological marvel before Bill Larnach made it happen…. Good for you but before you go the way of the electric car do the sums on what pollution is required to make the compnents of said vehicle from the ground to the finished product, quite illuminating and frightening. I don’t give a rats whether or not ANY pollution is produced, my prime objective is to reduce as much as is humanly possible my reliance on parasites whose only interest is fleecing me of as much hard-earned capital as possible. My carbon footprint is already one of the lowest of earthly inhabitants but I’m not about to get in a tizz about further reductions. Firstly, I object to subsidizing middle-east terrorists & the only sure way of cutting those slimeballs off is not buying their fossil fuels. Secondly I figure its only a matter of time before some enterprising bottom-feeder decides to play the peak oil game as a means to bump the price of fuel up a few hundred percent (again, I don’t give a rats whether or not peak oil is real, however that won’t prevent its use as an excuse to extort money from the sheeple) That said, I seriously doubt that a battery-electric vehicle involves any additional pollution over any others over their respective lifetimes. Among other issues, a battery-electric vehicle should have a vastly longer usable lifetime & even when charged with ‘dirty’ electrons (which isn’t my intention), they don’t pump out crap when doing what city vehicles spend most of their time doing …. sitting in traffic jams. The IPCC’s main conclusions from the report released on 5th October 2013 were that climate change was unequivocal, mankind’s role in it was clear, and it was essential to make deep and rapid cuts to emissions to avoid the worst impacts of runaway climate change. Which report did you read? Yes, maybe but in years gone by they have come out with such doom and gloom scenarios that have proven themselves wrong that no one who thinks for themselves believes a word that comes from them any more. We had our own Climate Change Commissioner come out and using the latest “science” from the IPCC and our own Climate Change Commission tell us all that we would never have enough rain to fill our dams again, that coastal towns would be inundated because the oceans would rise up to 3m and guess what, the dams up here are at 97% the oceans haven’t risen and not only was he wrong but the “science” was wrong again. It certainly makes one wonder why the IPCC gets it so wrong so often unless of course it has to do with the amount of money they expect to receive to keep this farce going and them in a job. Believe what you will but the “science” is wrong on so many occasions that its become an embarrassment not only to them but to those who believe in the religion of Climate Change who are more and more seen as the loonatic fringe or have a vested interest in keeping this myth going for monetary gain. By the way SV, I’m not against renewable power, my whole house runs on it, I have water tanks for my water and we are almost 100% self sufficient, what I am against are those who for reasons of their own push this barrow to further their own ends and mostly based on faulty “science” that has more holes in it than a sieve. I don’t have a shred of doubt about the reality of human caused global warming. One only has to acknowledge the centuries of frantic shoving all manner of crap into the ecosystem whilst furiously destroying all natural regulation systems to be aware of the damage caused by feral humans. No sentient being could claim those activities would have a beneficial effect. On the other hand, the carbon tax was only ever conceived as a cash cow. No politician, especially one as evil-minded as the red-headed witch, can be trusted to create a new income stream without ulterior motives. Mind you I’d no more trust the Wacky Wabbott to act honorably, his loyalties are to someone other than the Australian people. You lost me on the first post. You obviously have an ulterior motive, being the CEO of a Solar company and will go to any lengths to perpetuate the myth of man made Climate Change. The Climate is changing and has for billions of years and will when we are all dead and buried. The Models of the IPCC are great at predicting the past as stated but when are they actually going to get the present or the future right once. Models can be made to do whatever is the bent of those using them and I’m sure that someone who hasn’t an axe to grind could use them to come up with a completely different outcome than those whose very livelihood depends on the outcomes. Those same scientists and models cant even get a day to day prediction of the weather right and we are supposed to believe that they can predict what is going to happen in the future, give me a break. My main objection to Flannery is that he is not a Climate Scientist, he has misled the Australian public more than once, he has made it possible for gullible State Governments to build water infrastructure plants and pipe lines that are now rusting away at a tremendous cost to the tax payer, he has used his position to and his misinformation to allow a federal government to implement a Carbon Tax that did nothing to alleviate the amount of carbon we produce but just raised the cost of just about everything we buy or use. That in my books is an abuse of power and nothing anybody can say, google or whatever can change that. Add to that the snake oil salesmen who have made millions out of their Doom and Gloom scenarios without doing anything about the problem , if it exists.An Inconvenient Truth, perhaps. That’s around 5-7 times the amount required for the whole country!!! Interesting answer but where may I ask would the displaced people go, how much would the power cost, a lot more than we are now paying and that’s providing that the solar fields and the battery banks were serviced daily at another cost to the public. Just the infrastructure alone would be astronomical and people would soon realise that whilst they thought they were being ripped off by the power companies of today the rip-offs by the renewable Energy providers would escalate at such an alarming rate that most couldn’t afford to have power anyway. People can go on and on about Renewable Power and its benefits but until they have bought and used that power themselves most of what’s written is conjecture and misinformation by vested interests. Stop the Thingies, just what I would expect from a follower of the religion of Climate Change, don’t allow anybody that doesn’t agree to have a say, typical of this whole argument that is so biased in forums like this that even common sense has a hard time getting a foothold. I’m still waiting for you to explain your rationale, kimalice. We are assisting six groups of tenants who ‘can’t afford to put panels on their roofs.’ If your claim that you’re using solar power is true, *you* are in fact doing so “…at the expense of those who cannot afford to put panels on their roofs…” We are, in fact *funding* the very people you accuse us of denying access. Sadly like many of your comments, your rationale isn’t rational at all. And I recall that some fool once contended that if steam locomotives exceeded 50mph, passengers would expire, blood gushing from their noses… . Having watched solar panels double in power and battery technology exceed our wildest dreams*, we have to laugh at stuck-in-the-mud naysayers who want us chained forever to fossil fuels. Codswallop? A nice anachronism from a time when soda bottles relied on a marble stuck in the neck of a bottle. K I Malice is stuck in a similar time warp… . * Two of our four chainsaws are powered by rechargeable batteries, an ‘impossibility’ a decade ago… . The desire to chain us to fossil fuel is quite obviously motivated by purely financial issues. Its clearly impractical for the average electricity consumer to generate their own power via fossil fuel, consequently its necessary to attack concepts that provide alternatives (mostly photovoltaic). We see exactly the same kind of arguments used to oppose battery-electric vehicles which potentially reduce reliance on fossil fuels. Furthermore, the philistines are assisted by lying politicians who dream up fanciful stories in vain attempts to justify their male bovine dropping. Never let the truth interfere with a good story. “Never let the truth interfere with a good story.” Funny you should say that as most of the fairy tales we now hear are from the Climate Change authorities who haven’t yet got it right after all these years of practice. People aren’t attacking “renewables” because they can but because they are highly impracticable, highly expensive, have a shelf life of 10 years for storage requiring an outlay of even more money and require people to get off their fat duffs and maintain their system unlike just plugging in an appliance for instant gratification. Let’s face it people are basically lazy and anything that makes work is usually put into the too hard basket as they will claim they are time poor. Of course you wont agree and this will give you another chance to rail against the Politicians and their lack of leadership but my advice to you is, if you don’t like the way the country is run, do something about it, get over your inability to accept that not everybody agrees with you, especially those in power or leave, simple. Been there done that politically and don’t care to repeat the exercise. When we have the likes of that unspeakable bottom-feeding grub Rupert Murdoch(and no doubt a bunch of his equally despicable cronies) manipulating what passes for democracy there is little opportunity for individuals to make a meaningful input. These days I do my own thing & the system can go to Hades for all I care, just don’t expect me to support a system that only exists to perpetuate a mammoth confidence trick on all and sundry. The ‘climate change authorities’ & for that matter ‘authorities’ generally will ***NEVER*** get it right because they are driven by a totally different agenda to what they tell us, with the strings being pulled from elsewhere. Having seen the accelerated disappearance of many of the world’s glaciers reflected in the ‘yearposts’ demonstrating how much more rapidly the climate is changing, we’ve no delusions about climate change. How much of that more rapid acceleration is man’s doing is hard to quantify, except when you reflect on industrial development over the decades. Despite climate change deniers, we’ll enjoy more and more alternative sources of power in coming decades. Earlier this year we were amazed to see tens-of-thousands of electric motorcycles and bicycles in most of Vietnam’s cities, where a little over ten years ago, we saw none. Positive change will happen where economic, technological and environmental imperatives are in sync. In our case, a major fall in interest rates made it possible to add 48 SES panels to our rentals. Most of our tenants now enjoy free power. The pay-off? They’re happier, they lease longer than our other tenants, they respect and understand our priorities, and they’re more likely to install solar HWS and solar electricity systems when they eventually build… . You can go on and on about man made Climate Change but where is the definitive proof. To base all the “science” on 200 years of records is ridiculous. 200 years in the life of this planet is but a mere blink of an eye. We have seen from the fossil records that the earth’s climate changes constantly and for one group of people to claim that they can pinpoint the latest change to man is tilting at windmills. I dont doubt that the Climate ids changing but i do not believe that it is man who is doing all the damage as this could be a natural progession of the earths own Climate Clock. As for the renters enjoying free power, is that at the expense of those who cannot afford to put panels on their roofs? Hey, don’t tilt at windmills. Ours has faithfully moved rainwater between our five tanks and two main houses for 25 years, with only the replacement of a connecting rod and two leather buckets, during more than two decades. It’s probably one of the more enduring examples of use of the elements during the last two centuries! Your statement: “… i do not believe that it is man who is doing all the damage…” is however, difficult to fault. We’re certainly a part of that ‘progression’ and, according to insurers, we’ll pay more for that privilege. I’ve no doubt humans are speeding up the progression. While your perception of “…200 years in the life of this planet (as) but a mere blink of an eye…” is quite a _practical_ contribution in terms of slowing the damage, we probably need to do a little more. Our kids probably will… . Firstly I paid for my system myself, all $46,000 worth, so don’t come at me being a bludger on the public purse as those who have had panels put on their roofs with subsidies and an overgenerous payback system that adds a burden to those who can least afford it. I paid taxes for 50 years as well but don’t expect the public to fund my extravagances, its not a right whichever way you look at it and I’m afraid that i believe that those who do think it a right are the lowest of the low. Stand on your own two feet for a change instead of having this they owe me mentality that so pervades this society. You are without doubt a prime example of whats wrong with society these days. HaHa… . 😀 Your definition is laughable. Haven’t taken your grumpy old man tablet today? Ho hum. Obviously you believe its possible for feral humans to pollute the ecosystem for centuries & worse still,systematically destroy all natural regulation systems without any effect whatever !!!! Whether or not expert A or expert B has a clue what they are on about, Blind Freddie can see that humans have been stupid enough to defecate in their own nests, something that even a supposedly ‘dumb’ animal has the nous to avoid. It may not be practical or even possible to avoid the consequences however that doesn’t by any means excuse the head in the sand approach so typical of climate change deniers. Let’s get this straight, I am not and never have been a Climate Change denier but and a big but, I will not and do not believe that man is solely responsible for the Climate Change that is taking place as we are led to believe by those that use the religion of Climate Change to belittle others. Definitive proof, not some pseudo scientific mumbo jumbo based on just 200 years of records, if you please. Natural climate change in the past proves that climate is sensitive to an energy imbalance. If the planet accumulates heat, global temperatures will go up. Currently, CO2 is imposing an energy imbalance due to the enhanced greenhouse effect. Past climate change actually provides evidence for our climate’s sensitivity to CO2. Calling it mumbo jumbo does not make it mumbo jumbo. The accepted odds (from 98% of the scientific community) that climate change is man made is 95%. I’m not prepared to wait 50 years to get that to 99%. I’m going to act now. My conscience demands it. My kids demand it. It is why I got out of mining and into solar 7 years ago. As I’ve said previously, mankind has been polluting the world since time immemorial, and more so since the industrial revolution. Precious little attention has ever been given to the consequences, especially when it would cost money to reduce harmful emissions. To propose that we could continue to s**t in our own nest ad infinitum with no adverse consequences is the height of stupidity. Those who claim mankind could not possibly be responsible for climate change can only be motivated by the prospect of financial loss … they clearly don’t give a rats about what we are doing to the ecosystem. The arguments that some expert or other didn’t cross all his ‘t’s’ or dot all his ‘i’s’ are merely distractions. Mankind is unquestionably vandal-minded & profit-seeking with no concern for responsibility / accountability.. Note however that I don’t go along with political solutions like the carbon tax / emissions trading scheme because they are nothing more than opportunistic revenue-raising con-jobs that can never do anything to counter global warming. Regardless of the howls from the nay-sayers, photovoltaic power generations must have a significant impact on emissions & battery-electric vehicles would also assist, if only because they don’t pump out crap when doing what most city cars spend 90% of their lives doing …. stuck in traffic jams. It’s interesting to read a Greenie who thinks it’s acceptable to excise part of a National Park for an industrial application – there may be some common-sense left in that group of flat earth troglodytes?? Remove the political and ideological rant and this is a very desirable outcome. Said on the basis that Australia is never going to stop global warming happening but clean renewable baseline energy is a great target to seek. I am all for conservation & renewable energy etc, but let’s be realistic about the pond in the desert! That is totally UNREALISTIC! Yes I worked for 25 years in power generation, 16 of those years in hydro and pump storage in the Snowy Scheme at Talbingo / T3 Power Station. The real value for solar coupled with minimal electrical storage is in stand alone applications such as lighting and remote locations such as electrically driven gates on peoples’ homes and rural property. Dont agree, I live 100% solar and it works fairly well in running a two person house as long as you dont overload the system or have a couple of days where the sun doesn’t shine. The cost is prohibitive for most people but in some cases cheaper, as in our situation than having power lines run to the house. As I said, in stand alone applications solar can work. I merely pointed out a couple of examples. What is being advocated with ponds in the middle of Australia and pump storage is absurd – the pipeline losses and line losses would be horrendous and the cost! That would be be beyond ABSURD. Theory is great, but practicality brings you back to earth. Hey Finn, love your work. For ease of reading these comments and threads could you consider the LA Times policy of not publishing any comments that are not factual. You might also expurgate hatred, misogyny, illiteracy, repetition, unwarranted negativity, unsubstantiated claims and blatant nonsense. There wouldn’t be much left but perhaps that might open the space for creative thinkers who don’t want to wade through the bile of the sad attention seekers. Just a thought..